The Nest.co.uk Bed Buying Guide looks at everything you need to consider before buying a new designer bed. From designer bed frame choice to mattress size, we want to help you choose the right items for you, to ensure you get the perfect night’s sleep. Purchasing a new bed is often a fraught decision. There are so many options and choices out there that we often feel overwhelmed, and end up putting it off. But a good night’s sleep is paramount to our day-to-day lives. We spend a third of our day sleeping so it’s important to choose the right design that works for you. Our Bed Buying Guide aims to talk you through the many options available, from style to materials, to help you make a clear and informed decision. It’s a key purchase that, when chosen correctly, can really improve the quality of your sleep, and we want to help you get it right. Deciding exactly what works for you, and understanding your needs and requirements, is the first thing to consider when purchasing a new bed. Think carefully about what you want from your new purchase. Are you looking for a replacement bed for the main bedroom? Or is it for the spareroom, where it will be used much less? Think about its surroundings. Do you need your bed to facilitate storage? Also, think about how you like to use your bed when you aren’t sleeping. If you read a lot, you might want a headboard with built-in lights so that you can read easily and comfortably. Or perhaps a built-in bedside table for your Sunday morning coffee might be important to you? Finally, and most crucially, think about the way in which you sleep. If you feel trapped by tall frames, open styles are available, and vice versa. Thinking about the way you sleep is also important for when you come to choose the right mattress, which we explore in more detail later on. There are a lot of things to consider, so take a few moments to really think about what you would ideally like from your new purchase – and don’t forget to write it down! Once you’ve decided what you need, you can think about style. Choosing the right frame is all about personal taste and preferred choice - and luckily we have a fabulous range for you to choose from. Upholstered beds offer supreme luxury, as well as exceptional comfort. Covers can often be removed and dry cleaned too, so no need to worry about any breakfast mishaps! Take a look at beds from the Cassina or Moroso collections for stylish and contemporary upholstered beds. Metal frames suit pared-back and minimal interiors. They also never go out of fashion so you know your purchase will look great for years to come. We love the Zanotta 1706 Nyx Bed for a simple, non-fussy and stylish choice. Wooden frames are endlessly versatile and will suit just about all interior schemes. 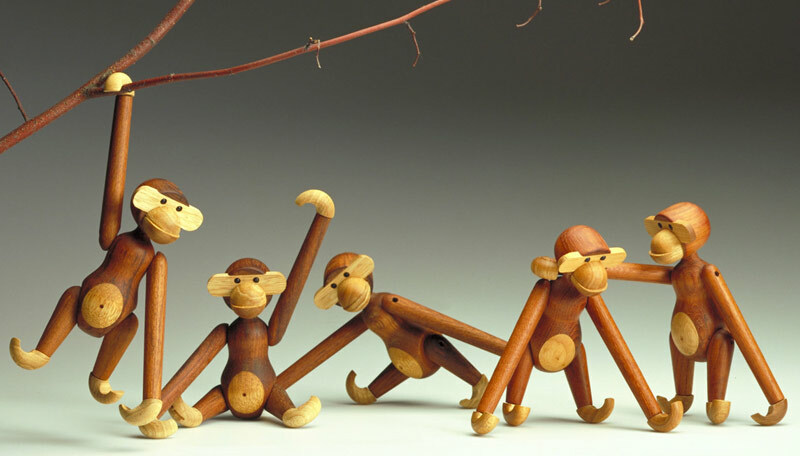 They can be whatever you need them to be: traditional with hand-turned spindles or modern and made from simple planks. Shop our Zeitraum collection for effortless designs in walnut or cherry, or our E15 collection for considered designs in oak. A leather bed radiates pure luxury. Treat yourself to a Poltrona Frau design upholstered in the unique and desirable leathers from their Heritage collection. Also see the Cassina collection for innovative designs from Rodolfo Dordoni. If your bed needs to work on another level, we have a large selection of designs that should satisfy all needs. If you rely on your bed for additional storage we have a collection of beds that are raised high enough to fit storage boxes underneath. As our lives get busier, time spent snoozing in our beds has become more and more precious, and guaranteeing a good night’s sleep not only comes down to the right frame, but also the right mattress. All mattresses offer different levels of support, tension and comfort and it’s important to get the one that’s right for you. Below we take a look at the two most important factors to consider when choosing a mattress. Firstly, think about how you sleep as this will determine how much support you’ll need for your back and head. There are all kinds of mattress designs on the market now - even dual tension mattresses that allow you and your partner to choose individual tensions that suit you both. Secondly, think about how often the bed will be used. The mattress in a guest room will not need to be of the same quality as the mattress you use on a daily basis, for example. Below we have listed the three most popular mattress types with a brief description of what they are and how they work. Together these are the most commonly-used springing systems in the world for budget priced mattresses. Continuous coil mattresses are made from a single looped wire, and opencoil mattresses are made of single springs fixed together by one wire. They have a border rod or wire running around the mattresses edge which gives the mattress a firm edge and helps retain its shape. These mattresses need to be turned regularly to prevent an uneven sleeping surface developing - which can be caused when two people of differing weights share the same bed. Both continuous and open coil mattresses are durable and offer a traditional level of support. Pocket sprung mattresses are slightly more luxurious than continuous/open coil designs. They have individual springs, each housed in separate fabric pockets, ensuring individual movement. This stops you rolling towards each other in the middle of the night if there is a size difference between you and your partner. These individually sewn pockets also allow the mattress to shape to the users body for a more comfortable night’s sleep. They commonly have hand-stitched sides for strong, stable edges, denoting a high level of craftsmanship and quality. Again, pocket sprung mattresses need to be turned regularly to maximise life. Memory foam mattresses (also known as viscoelastic) are made from a temperature-sensitive material that responds to heat and moulds to the shape of your body - helping to relieve pressure points and maintain correct posture while you sleep. Memory foam is hypo-allergenic and has anti-microbial properties, so can be a great choice for allergy sufferers. A downside to memory foam mattresses, however, is that they can reduce air circulation around the body, making the mattress feel warmer. While this can be beneficial in the winter months, it can become uncomfortable in summer. Memory foam mattresses cannot be turned, but they should be rotated (head/toe) regularly to keep them in excellent condition. Changing your bed linen and adding some decorative cushions is an easy way to update and refresh your bedroom decor. Add plenty of colour and go for cosy textures and fabrics in winter, and cool, crisp linens in summer. Mix and match prints and pillowcases for an adventurous style! We love the Hay Colour Block bed linen collection for graphic patterns and bursts of colour, and the Muuto Mingle Cushions for adding texture. It’s time to avoid the late night notifications and disengage from the digital word for a sleep undisturbed. After a day spent using electronic devices, it’s time we allowed ourselves to shut off and truly relax – by keeping yourself engaged with an electronic device, you’re tricking your mind into thinking it needs to be awake. Why? Well, Melatonin is a hormone that tells our bodies it’s time to sleep, this hormone is prevented from being released when we are exposed to blue and white lights emitted from our electronic devices. So put down your iPad and provide yourself with at least thirty technology free minutes and allow yourself to sink into a deep (electronic free) slumber. The bedroom is an entirely personal oasis – and often, the most personal room of your home. Colours significantly affect our mood and emotions so adding the right colour to your bedroom couldn’t be more important for a blissful nights sleep. Lie back, relax and prepare for slumber with calming hues, we recommend you induce your bedroom with shades of blue and green. Feeling blue needn’t be bad when it comes to engulfing your bedroom in hues of blue for a good nights sleep. Blue is said to slow down the heart rate and even reduce blood pressure – perfect for capturing a calm, soothing and serene environment to sleep in. 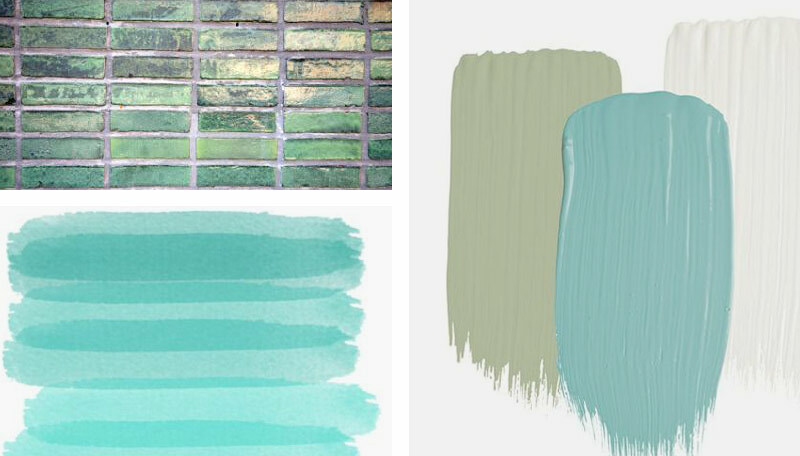 Go for green if you’re after the most restful colour to the eye, green shades evoke a grounded feeling due to them being found in nature as well as providing comfort due to their warm tones. Tailor the ambiance to suit your mood with dimmable lighting and allow your room to become illuminated with a diffused and mellow glow – gone are the days of harsh bedroom lighting. 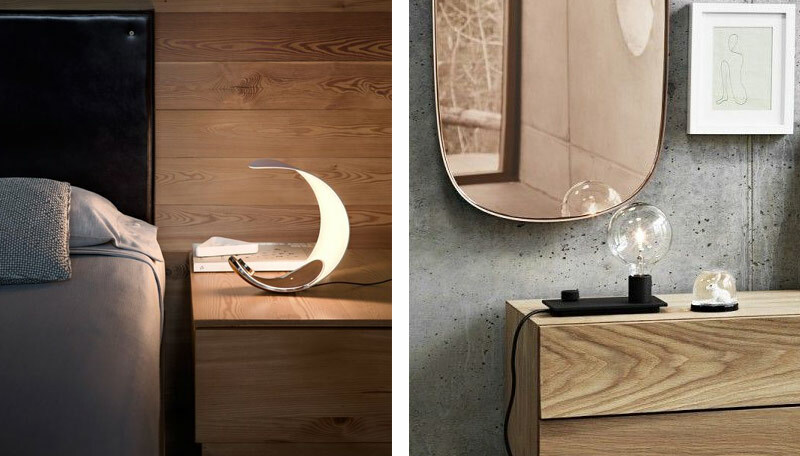 Falling into slumber needn’t be easier than gently transitioning your room from light to dark with a dimmable lamp. Choose the Luceplan Curl Table Lamp that allows you to modify both the brightness and white quality of the light – what more could you want? Or if you’re looking for something a little bit more fun and unique, the Muuto Control Light is just right for you. This light is compact, simple and provides a smart way to add a splash of colour to your bedroom as well as being dimmable. • Vitra Doll No.1: Designed by Alexander Girard, this wooden doll is sure to encourage a smile. Half toy and half decoration, the Vitra Doll adds a nostalgic touch and allows you to reminisce of care free, childhood years. • Hay Kaleido Tray: This series of geometric trays add a pop of joyful colour to your bedroom – not only lovely to look at, but also incredibly functional as you can place all your bedroom bits and bobs in them. Offering an array of colours and shapes, you can’t help yourself but play around with the configuration of the trays – you’ll find endless combinations. • Rosendahl monkey: Paying homage to the playful child in us all, this delightful monkey displays an impish expression alongside a twinkle in his eye. This much loved design classic fills your room with both humour and soul. Banish the curtains and allow the natural morning light to flood in to your room and awake you in the most natural way possible. Exposing ourselves to the bright, morning light sends our body a natural cue to wake up as it reduces the production of sleep hormones – This encourages us to rise and shine whilst feeling less sleepy and more awake, what better way to start the day. We hope you found this guide useful, but if you have any questions please give us a call on 0114 243 3000 or drop us an email at info@nest.co.uk and we’ll be happy to help further!